Down & Dirty: drop and give me your best photo! This month's photo contest at Gardening Gone Wild is all about perspective. David Perry challenged his readers to get down on the ground and shoot from knee-level or below. He wants shots that evoke a visceral response, shots that look at a (perhaps common) garden object in a way that's fresh and unexpected. This is a challenge after my own heart. I carry a rain poncho in my camera bag so I can get down & dirty with whatever subject catches my eye, even if it's rained the night before. Who wants to miss a great shot just because the ground is a little squishy? This copper beech is in my sister Sarah's yard. It's a magnificent tree from any angle, but when you're lying on your back, looking up I-don't-know-how-many-feet, the sense of exhileration and vertigo is remarkable. I took tens of shots, but this one pleased me most. I think the placement of the out-of-focus trunk in the upper right quadrant adds a sense of dizziness. It's a noble tree that dwarfs us all. What a wonderful shot, it reminds me of our visit to Rocky mountain National Park last year ...looking up through the Aspens. Thanks Susie. BTW, I tried to leave a comment on your praying mantis post and wasn't able to do so. Can't find an email address for you, so on the off chance you check back here...I tried w/my google account,w/my name/URL\, and as anonymous. Each time my finely crafted words just disappeared! Nice depth, nicely composed and I love the detail in the leaves when it is full size. It must be a beautiful autumn there. Thanks Ditto, coming from you that means something. And yes, sutumn in New Hampshire is a wonderful thing to see. I love this photo! Brilliant! Fabulous shot! 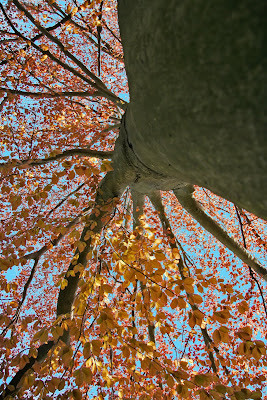 Reminds me of the noble trees I was looking up into while I ate my lunch at Inwood Hill Park yesterday. Simply fantastic. I love this shot! This is a great picture! I've tried those looking up into the sky photos, and they're so hard to do! Thanks for sharing. Great shot -- I love the colours. Nice perspective- would make great wall art.